Mercury retrograde is upon us once more. During 2014, Mercury will be retrograde during three periods: February 6th-28th, June 7th–July 1st, and October 4th–25th. The earth turns on its own axis. Too, while turning on its own axis, it revolves around the Sun. The zodiac is a stationary belt that (from our perspective) appears to encircle the earth. We use the backdrop of the zodiac belt to describe other planets' positions in relation to the earth. This imaginary belt is divided into 12 zodiac signs. When Mercury appears to be traveling "backwards" in terms of the forward order of the zodiac signs, it is said to be retrograde. Three to four times a year, we enter another Mercury retrograde (Mercury Rx) period. This is a time for pausing, stopping to catch your breath, for doing things over and for second chances. It is a period for review, for reconsideration and for learning from past mistakes. On the side of caution, this is a time for safe and sane driving habits, for taking care of your motor vehicles and for scheduling repair work. You will want to be careful with communications of all kinds, including speech, mail, email and the written word. Make sure you say what you mean. Look for ways to correct, adjust, revamp, reschedule, repeat and refurbish. Mercury Rx gives you the time you need to catch your breath, to revitalize, to reclaim and to nurture and nourish projects special to your heart. It can also be a time for improving relationships, for starting over and for recommitting. Mercury Rx most often affects the house in your horoscope where the current Mercury is transiting. It also affects communication, short distance travel, some family matters, snail-mail, email, telephone calls, cell phone calls, electronic equipment, motorized vehicles and motorized equipment. It affects technology in general and conversations in particular. Think before you speak and make sure you are being understood and that you understand. Ask questions. Give explanations. Slow down. Take your time. When negatively aspected in your personal horoscope, Mercury Rx will bring challenges, delays or reversals in one or more areas of your life. Your fax machine could break down and need repair, for example, or a preplanned trip to visit loved ones could be postponed or altered in some way. You may find that the postal service delivers your neighbor's mail to you by accident or that you receive someone else's bill, in your name, by mistake. This is a good time to get needed repairs, alterations or to change your mind. When positively aspected in your personal horoscope, Mercury Rx will be a time period wherein you can catch up with your life and you will be able to get a lot of things done that had heretofore been problematic for you. Often, you can iron out any wrinkles in your life and gain understanding or insight with someone with whom you have had relationship difficulties. 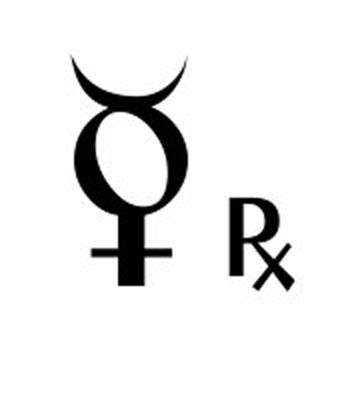 Mercury Rx will give you the opportunity to reexamine things and to chart out new paths or enlist the aid of others. You can mentor or be mentored. You can change directions or cancel something altogether. You will function best during any Mercury Rx period, no matter how the aspects impact your life, by staying open-minded, by taking a breather and reflecting on your life and circumstances, and by being willing to change, manage or revise. Your free will and your ability to analyze and discern your choices in life will always be your greatest allies. This article copyright © 2008-2015 Robbi Dyer. All rights reserved. Reproduction without permission prohibited. Robbi Dyer is currently the CEO of Alcyone Diversified LLC and owner of Golden Age Psychics Phone Line. She first began her studies of astrology and metaphysics in 1969. Robbi has been a published magazine writer for 29 years, 12 years as a columnist with Horoscope Guide magazine. She has also spent spent 7 years as a ghostwriter in the field. Today, Robbi writes two monthly columns for Astrology: Your Daily Horoscope, and annually for Psychic Astrology Horoscope. Additionally, she is on staff as an author of interpretation programs for Cosmic Patterns astrology software company.